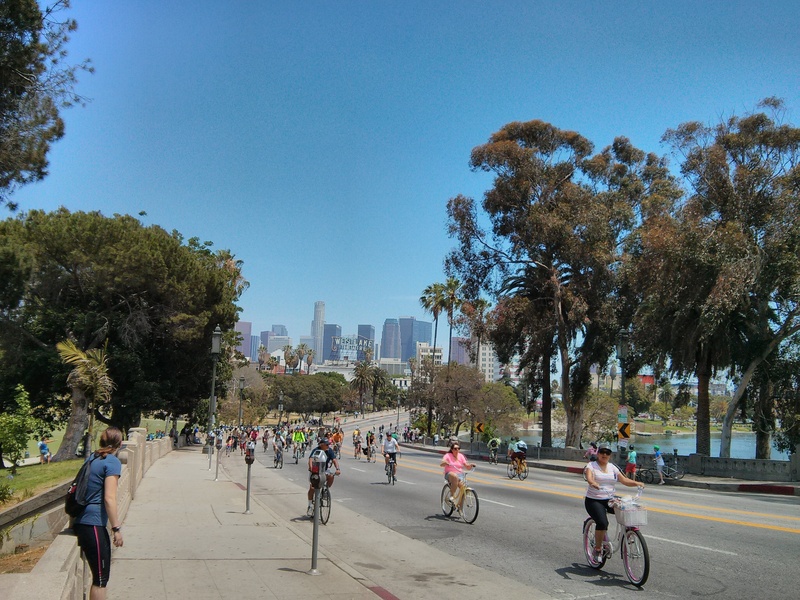 This year in Los Angeles, Ciclavia is scheduled to take place three separate times. The first one was in April, second in June and third in October. Every event goes through a different part of town. This one we are attending is six miles long starting from the Seventh Street metro station along Wilshire Blvd to the Miracle Mile Hub on Wilshire and La Brea. I’ve heard a lot of this event but have never personally attended. The Metro had a $10 deal for unlimited rides this weekend and I immediately jumped on the opportunity to relax on the train instead of sit in traffic. I arrived at Union Station at 10:30am and met Lisa outside the Starbucks. We started our long walk from Union Station down Wilshire Boulevard towards Korea town. 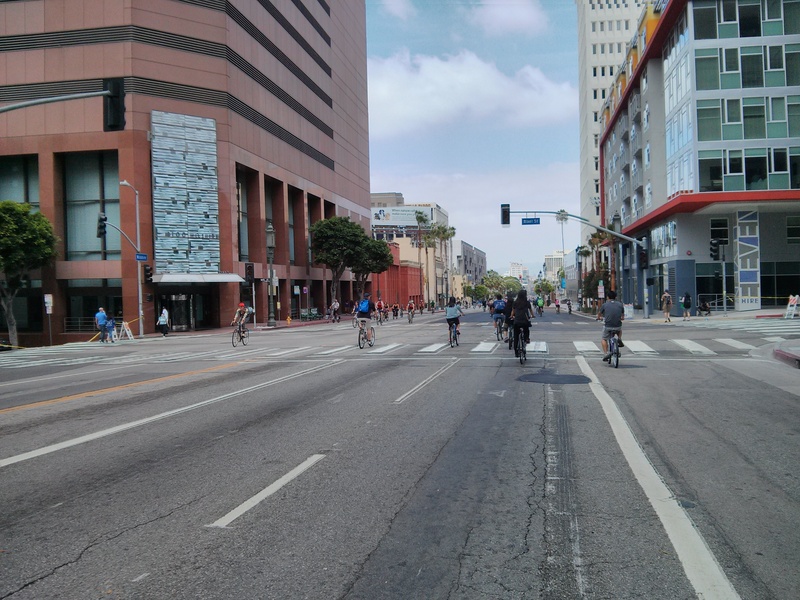 It was amazing seeing one of the busiest parts of LA being transformed into a automobile free zone. There were people on bikes, walking, rock climbing on the street and in general, just being friendly to each other. Instead of the normal tension I feel when driving through DTLA, the ambiance today feels relaxed. We walked about 4 miles and arrived at Korea Town. We grabbed drinks and lunch before heading back towards Lisa’s apartment. Overall, we walked 8 miles on Sunday and it felt great! I definitely want to check out the next Ciclavia in October with my bike. There’s still so much of LA I haven’t discovered! 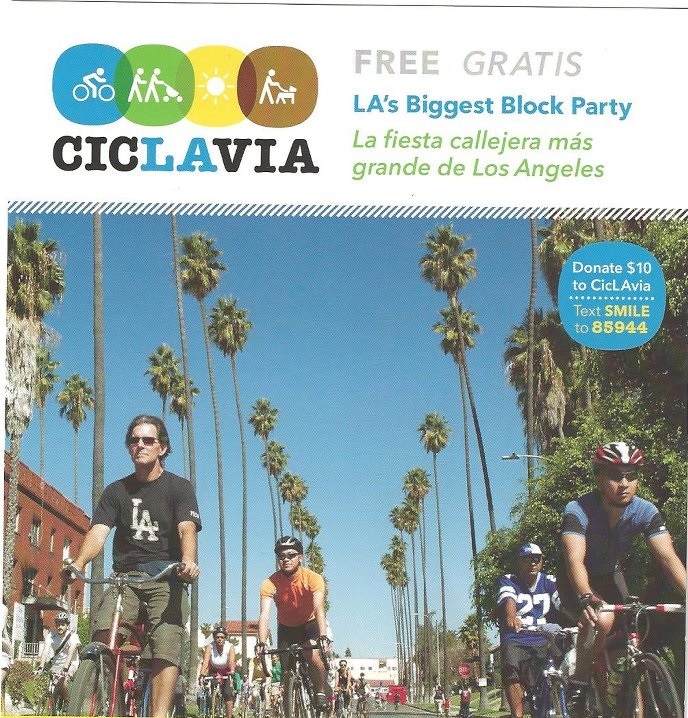 And just for fun, here is Louis on the 2012 Ciclavia flyer. 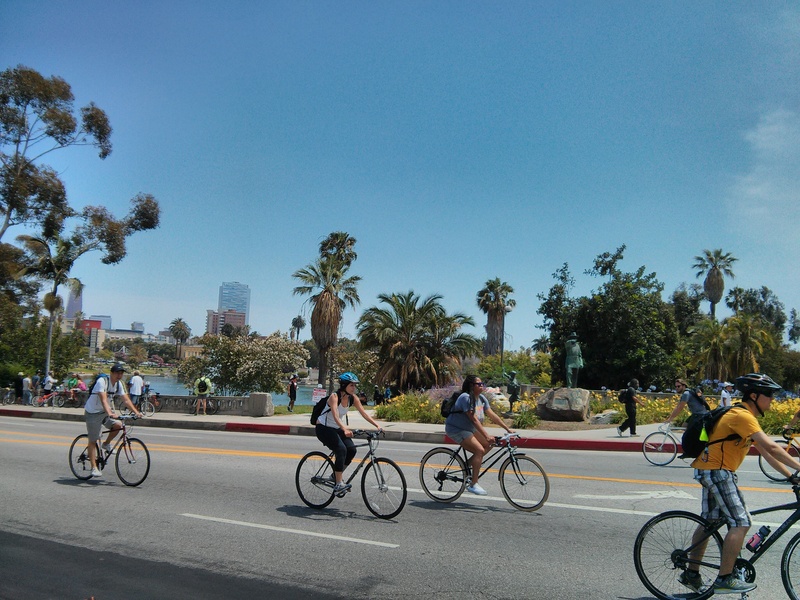 This entry was posted in Bicycling and tagged biking, Ciclavia, Los Angeles, walking by hikenoworklater. Bookmark the permalink. I love CicLAvia! Been dragging friends & family members since my first in 2011. It’s a hit & miss, some fall in love & would go again and some just don’t (smaller number tho). I was volunteer crossing-angel on this one (June 2013). Hope you make it in October!